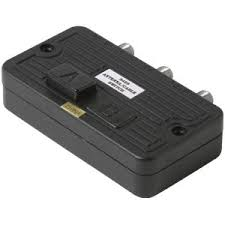 Channel Master digital TV splitters are used to split your digital TV, HDTV, cable TV, satellite TV, off-air, analog and digital RF signals and to distribute to multiple outlets in your home. All Channel Master signal splitters are professional grade and offer the cleanest distribution of your signal when performance and reliability required. Channel Master splitters meet stringent US and international standards. The CM 3214 is a high quality four port digital TV splitter. These splitters allow power passing to a single port, while blocking DC on all other paths, making them perfect for when a splitter needs to be placed between the amplifier and the power supply. They have been designed to meet the highest electrical standards. Careful isolation of the RF and DC paths is required to prevent saturation or burn-out of the ferrite core. This has been accomplished using a separate DC bypass core material which can withstand higher impulse spikes before saturating. 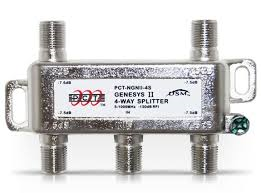 The GHS Series 1 GHz Splitters are state-of-the-art product lines designed and tested using the most current procedures. New performance features have been incorporated to make both series compatible with the latest digital and return path requirements. Low intermodulation design and optimized return band prevents high cable modem signals from affecting forward band transmission. The GHS-3P Series power passing to one port splitters have been specifically designed to meet the highest electrical specifications. Careful isolation of the RF and DC path is required to prevent saturation or burn-out of the high permeability ferrite core. This has been accomplished using a separate DC bypass core material which can withstand higher impulse spikes before saturating. 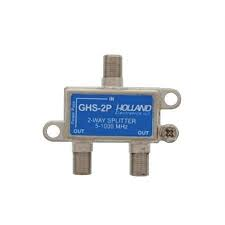 HOLLAND GHS-4P 4-way 1 GHz. 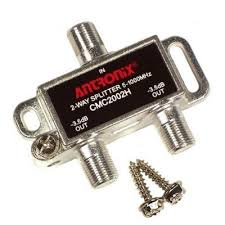 Power Passing Cable TV Antenna Splitter. 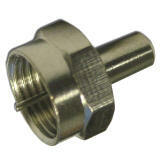 The GHS Series 1 GHz Splitters are state-of-the-art product lines designed and tested using the most current procedures. New performance features have been incorporated to make both series compatible with the latest digital and return path requirements. Low intermodulation design and optimized return band prevents high cable modem signals from affecting forward band transmission. The GHS-4P Series power passing to one port splitters have been specifically designed to meet the highest electrical specifications. Careful isolation of the RF and DC path is required to prevent saturation or burn-out of the high permeability ferrite core. This has been accomplished using a separate DC bypass core material which can withstand higher impulse spikes before saturating. A power inserter is used to back feed power to the distribution amplifier through one of the RF output ports. 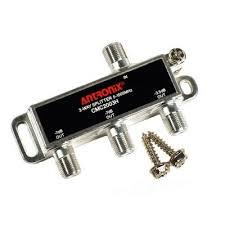 This allows the distribution amplifier to be mounted at a location where power is not available. The output port that is used to back feed power is usually marked as RF Out/DC In or something similar. It is important that if the power inserter is used that it is installed correctly. 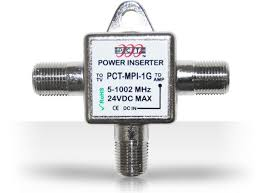 The PCTMPI1G power inserter has markings on the label to show the correct way to connect the cables. The side marked “To Amp” should never be connected to the TV. This port will have 12VDC on it, and it is possible that older TVs can be damaged by that voltage. Newer TVs should be protected, but not all may be protected. In most installations, it will not be necessary to use the power inserter. If the distribution amplifier is mounted near a power outlet, the power inserter isn’t needed since the distribution amplifier can be plugged directly into the wall outlet. There are no performance advantages to using the power inserter – it is only used to allow the unit to be remotely powered when the distribution amplifier can’t be located near a power outlet. 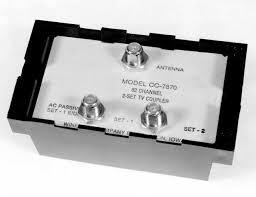 The CC7870 is a great option for coupling or combining the signal from multiple antennas. This can eliminate the need for a rotator and let everyone in the home watch any channel. 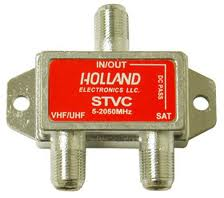 The STVC provides low loss diplexing of DBS and TV signals, separating them prior to satellite receiver input. Filters harmonics in the off-air spectrum from satellite conversion devices. 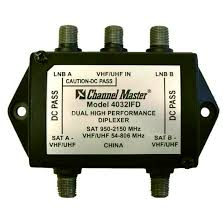 Channel Master 4032IFD dual satellite vhf/uhf antenna video signal diplexer. 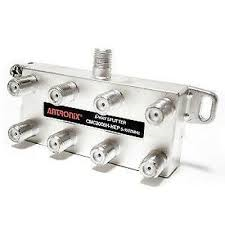 High performance commercial grade signal combiner / separator. Allows a choice between two video signal sources, such as Cable TV or Antenna, with the push of a button. Quality heavy duty construction. 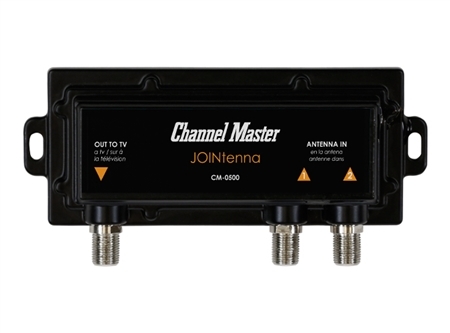 The Channel Master JOINtenna CM-0500 is an antenna joiner allowing feeds from seperate antennas pointing to different towers to elimate the use of a rotator. The JOINtenna also has a built in LTE Filter. All open or unused ports on signal splitters, LNB's, Multi Switches, etc. should be terminated. By doing so, you are decreasing signal leakage, increasing signal strength and protecting the port from water-damage and corrosion. 75 Ohm DC.